This famous photo of Leila Waddell, does anyone know much about it? Was this taken around a ritual? The symbol on her chest, what does it represent? Is the symbol on her skin, or on her shirt? I have a feeling it might have been taken around a Mass of the Phoenix ritual. 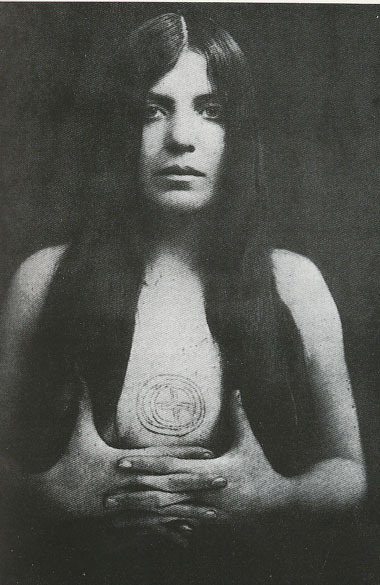 I believe the symbol might have been either a simple 'Earth' planetary one, or perhaps an O/X Rosy Cross-style glyph, carved or drawn onto her skin.